My most steadfast hiking buddy passed away this morning. His name was Jimmie (after the band Jimmie’s Chicken Shack). He spent 15 years and 4.5 months on this beautiful earth. I have written before how adopting this small puppy from the Montgomery County Humane Society in 1997 impacted my life (See Happy 10th Birthday, Jimmie Dog). 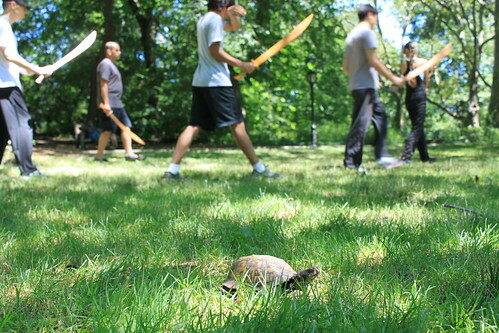 Jimmie’s adoption led to an active lifestyle. 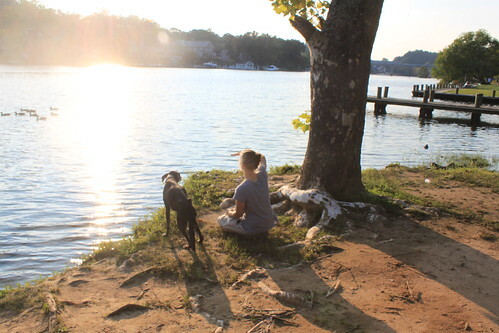 Finding adventures for my dog introduced me to my love of hiking and the mountains. His mere presence meant I was never really “alone” on any endeavor so he gave me the confidence (placebo?) to head into the woods alone and find my independence. He is a dog I will remember with gratitude. Last night, Ryan, Sagan and I took Jimmie across the river to Occoquan Regional Park. Jimmie was too weak to walk, so we drove to the park and we carried him to the shoreline. We sat under a sycamore tree. We watched ducks commute and ospreys tend to their young. We listened to the summer buzz of cicadas and people splashing on the west shore of the river. The sun set and together Jimmie and I took in one final view. I love you, Jimmie Dog. I wish you happy trails. More pictures of Jimmie’s Last Outing can be found on my Flickr site. 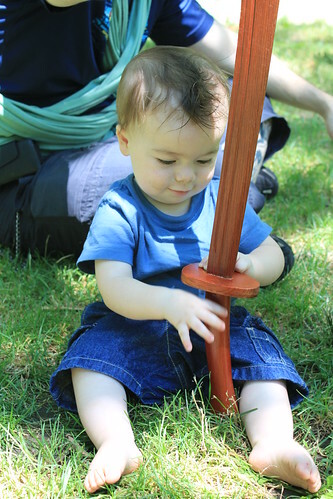 Sagan’s Uncle Thad is a Kung Fu instructor and his Aunt Rachelle also happens to have her Shao Lin black belt. 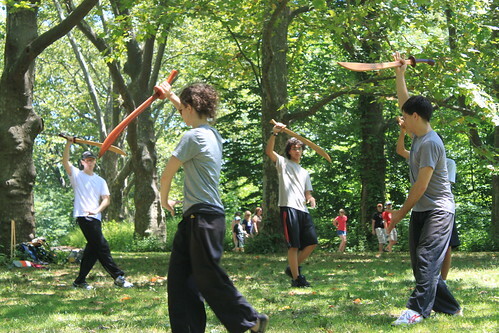 Our third full day in New York City, we travelled to Central Park to watch Thad teach a Ba Gua Broadsword class in Tupelo Meadows. My friend from high school Brian joined us and then there was a surprise spectator as well– an Eastern box turtle (Terrapene carolina carolina)! There was a small mishap. 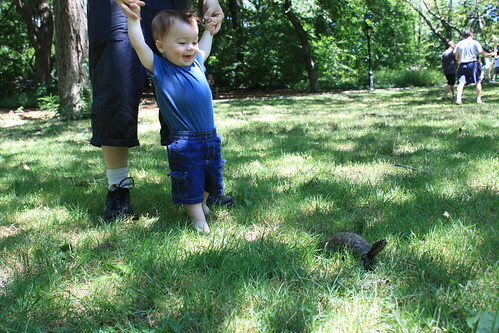 As Sagan worked on a poopy in the park, we were light heartedly encouraging him and joking around. Little did we know, this poopy was a free spirit which would not be contained by diapie, pants or onesie. 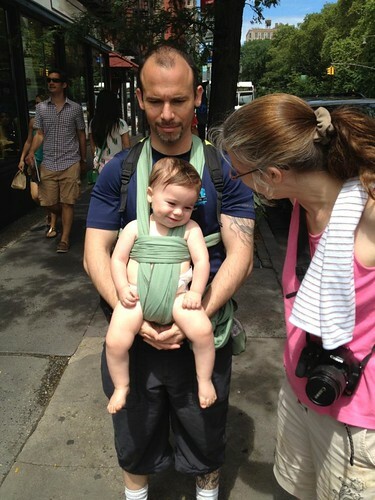 We had packed extra diapies and wipes (an improvement upon our American Museum outing), but we did not have an extra outfit handy. Sagan spent the rest of the afternoon allegedly getting stares from strangers (I was oblivious to judgemental looks). We ate at a nearby Shake Shack which Sagan seemed to really enjoy. After that, we stopped by the Upper West Side Patagonia which was having their annual 50% off sale. Sagan managed to find a baby in the mirror. At that point it was time to return to Brooklyn. We got to squeeze in some final visiting with Brian on the Subway. It was a lovely way to spend our last full day in New York. 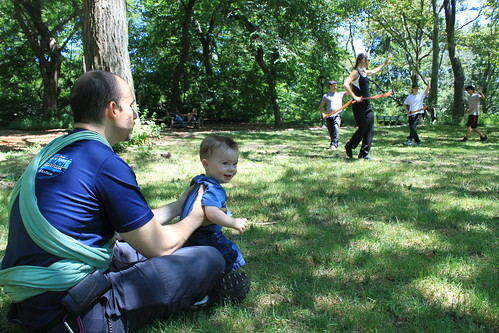 More pictures of our outing to Central Park can be found on my Flickr site. Typically our answer is he sleeps through the night, but we don’t. Sagan still “dream feeds”. Although our system is completely manageable (Team work, booyah! ), sometimes there is a little bit of envy when we hear other parents reveal how long their babies sleep. Today, my friends, the opposite should be true! My father passed away July 27th, but last night I got to have the most pleasant reunion with him while I slept. We were in a hospital lobby and everyone who attended my father’s funeral was there– all his siblings, his cousins, old co-workers, bridge players and even my boss Larry. Even though my father was still skinny, he had all the vibrancy and animation of his healthier days. He was surrounded by all his loved ones. He was telling his stories and laughing, laughing, laughing. When Sagan started to stir in real life, he had impeccable timing. He woke me up while my father’s laughter was still echoing in my head. Waking at that moment guaranteed that it was a dream that would get remembered. I love reading the trivia on imdb. When I’m watching movies at home, I typically have the trivia page open and I peruse it as the film plays.